We've repurposed our 1992 International School Bus into an adventure-mobile and tiny-home on wheels. After a yearlong journey of hard work, head-scratching and problem solving, the old bus is now a comfortable, fully-functional motor home. On this page, we'll explain the conversion process, check out the bus page to see how she turned out after all the work. The paint job is all about the prep. The first step of our conversion process was to strip all the external components of the bus—light lenses, mirrors, the stop sign, etc. We peeled reflective tape and removed cracked and deteriorating caulk. 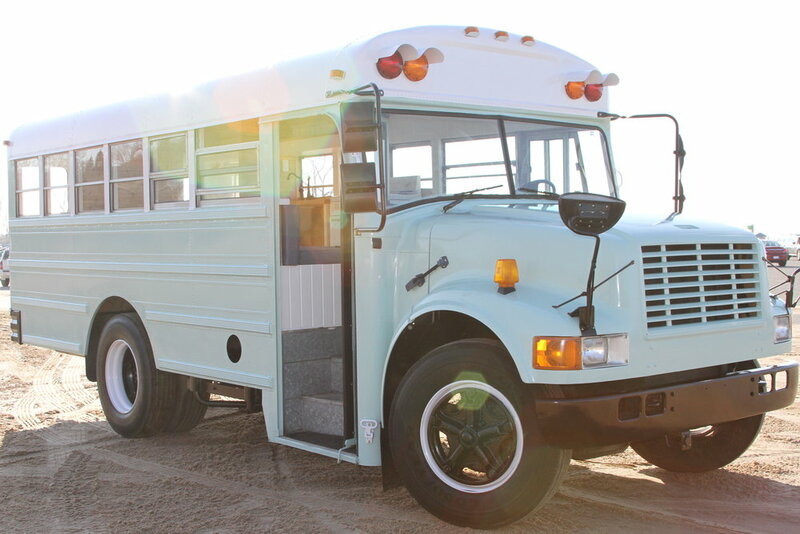 Once the bus was stripped down to her bare-bones, we ground rust and scuffed the entire painted surface. Fortunately, there wasn't much heavy rust, but wherever it existed, we ground it down with an angle-grinder and spot-primed the bare metal. With a high-grit sanding pad, we scuffed every square inch of her surface to eliminate the sheen (paint won't stick to a glossy surface). We eliminated some decals permanently and filled any holes with Bondo. After a final wash down with water and degreaser, we wiped down the entire bus with acetone. Finally, she was ready for paint so we headed to our local experts! There's not too much to say about this step, except, again: the paint job is all about the prep. Once we were prepped and ready, the paint job was a breeze. We used a high-gloss oil-based paint (comparable to Rust-Oleum) in a custom color from our local paint shop. Fortunately, we were able to borrow an indoor space for the paint application. With foam rollers, we applied the paint in about 70 degree temps, and the paint laid out beautifully. Best of all this process was cheap and after a year, it's still holding up great! For the interior build process, we wanted to start with a blank slate, so we thoroughly gutted the bus down to bare bones. We removed the seats, rubber mat flooring, and the bulky heating and AC units. We were left with a blank slate of bare sheet metal to build from.